This Autumn, along with Department of Health and NHS England, we launched our greatest drive ever to help people stay well through our joint Stay Well this Winter campaign. Resources to drive the campaign locally have been made available from our Campaign Resource Centre and we’ve seen an unprecedented number of people signing up to receive materials for the campaign; in excess of 7,700 downloads from Local Authorities, NHS organisations, pharmacies and other health partners. Partners are encouraged to take every opportunity to sustain the campaign in local areas throughout winter – contact us at partnerships@phe.gov.uk if you feel additional resources are needed to assist you in this. 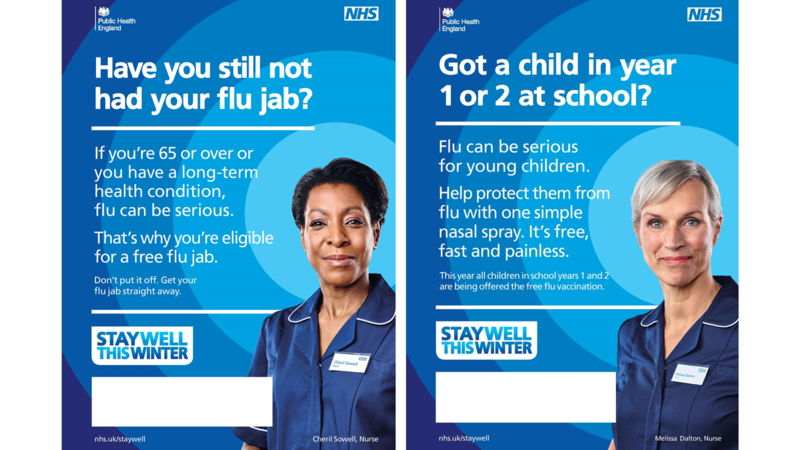 In addition, tailored information and resources to support schools in the delivery of the flu vaccination programme can be found on the Annual Flu Programme pages of GOV.UK and you may find resources from NHS Employers Flu Fighter campaign useful in encouraging flu vaccine uptake among health and social care workers. Key to our planning for winter is our Cold Weather Plan which was published in the Autumn. The plan sets out a series of actions that health and social care organisations, voluntary groups, and individuals can take to plan for cold temperatures and help reduce cold-related illnesses and deaths. Flu kills – every year. It’s easy to forget the impact of this virus that is with us every year but it is vital that we remain ready. Our weekly influenza surveillance reports indicate that flu activity is currently at low levels, but it’s usually from this time of the year onwards that we may start to see a rise in levels of flu virus circulating in our communities – often with outbreaks of respiratory illness in places like care homes and schools. This is why now is the time for us all to step-up our efforts in the fight against this very unpredictable virus. We only have to take a look at last season’s flu data to see just how crucial this is. Even though the 2014/15 flu season was of moderate flu intensity, the number of flu outbreaks in care homes and levels of excess mortality exceeded recent flu seasons (in common with many other European countries), demonstrating how severe the illness can be for those at greatest risk. Hospital surveillance in 2014/15 reported a total of 1,187 admissions to intensive care and high dependency units due to lab confirmed flu across England, and 8.4% of these resulted in death. It’s difficult to predict what will be the main circulating strain and what the impact that the infection will have this winter, including how many serious cases there might be - new strains can circulate each year with varying intensity. This is why the flu vaccine is different each year depending on which strains are circulating. This again reinforces the need for annual flu vaccination among those most at risk – including people of all ages with a long term health condition, pregnant women, those aged 65 and over and children aged 2 to 4 and of school years 1 and 2 age. 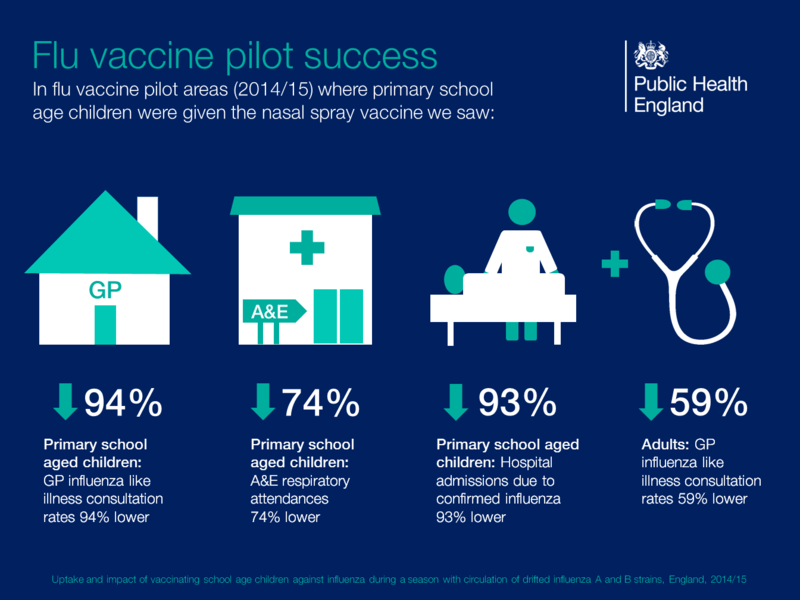 As part of the annual flu programme, more than 3.3 million children across England will be offered the nasal spray flu vaccine this year, making it the largest flu vaccination programme in England ever. Pre-school children aged 2-4 years have been offered the vaccine for the last two years but now the programme will also be rolled out to all children in schools years one and two as well. Select pilot programmes involving primary school aged children took place in the 2014/15 flu seasons. We only have to look at our social media channels to see that some parents may be undecided whether to take up the flu vaccine for their children. Does their child really need to have the vaccine if they’re otherwise healthy? - many may ask. But the recently published findings from last season’s school pilots provides a strong case for why they should. We know that children spread flu easily, and in areas where primary school aged children were vaccinated, there were significant benefits, both directly for the age-groups vaccinated, but also indirectly for adults and groups at high risk from the virus. It’s important to remember that this could be our elderly grandparents, or those close to us, more vulnerable to the effects of flu because of an existing long term health condition, like liver disease or neurological disease. Even for otherwise healthy people, flu can be a nasty illness; let’s be clear, it’s not like the common cold. Those affected are likely to need time off school or work to recover, children and perhaps other members of our families needing to be cared for - and we know how disruptive this can be to our busy daily lives. The graphic below details the substantial benefits that extending the programme to children is expected to bring to children and the communities around them, and may assist in helping parents to reach an informed decision when it comes to vaccinating their children. Last flu season, we saw an encouraging 4% rise in vaccination rates for pregnant women and we hope to see a further increase in 2015/16. Even with this increase, just four in 10 pregnant women accepted the offer of flu vaccination, despite figures showing that 36 pregnant women died from flu between 2009-12, accounting for 1 in 11 of all maternal deaths during this period. Half of these deaths are thought to be preventable because they occurred after the vaccine became available free-of-charge to all pregnant women, but none of these women were known to be vaccinated. As healthcare workers we must also remember our professional duty to be immunised against common serious communicable diseases. Good infection control measures, although important in reducing the risk of influenza infection, are not sufficient alone in preventing the spread of flu, which can have a fatal impact on frail and vulnerable patients, and cause severe disruption in hospitals, care homes and communities. 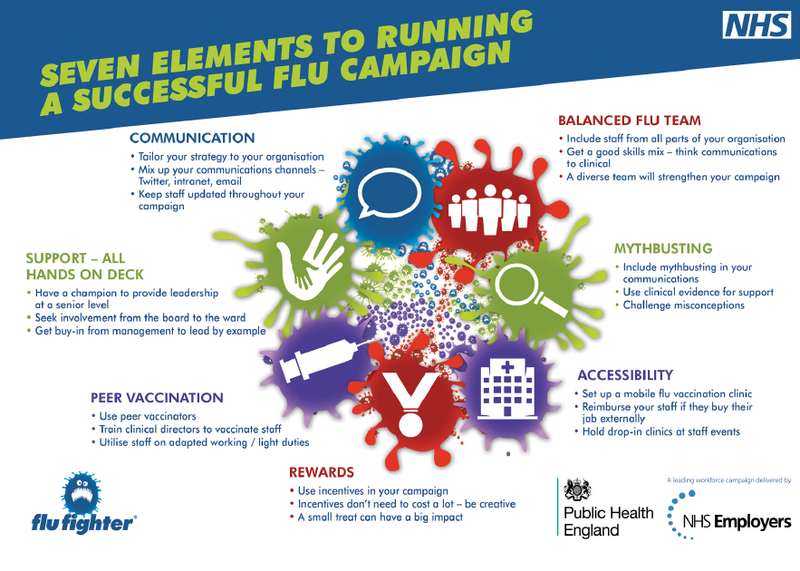 NHS Employers’ Flu Fighter campaign is well underway, and the campaign team – together with PHE – have been engaging with NHS Trusts to identify their Good Practice Formula, detailing the seven key elements to a successful flu vaccination campaign for healthcare workers (see graphic below). PHE will publish the first vaccine uptake figures for healthcare workers in mid-November. This year, for the first time, NHS Employers is working with the residential care sector to identify how flu vaccination can become routine for care workers, identifying both challenges and examples of good practice. A tailored set of campaign materials has been made available. In England, antiviral medicines may be prescribed at any time in the secondary care setting for patients with suspected influenza infection. However, general practitioners in England may only prescribe these medicines in primary care when the Chief Medical Officer has announced that influenza is circulating within the community (as at 11 November 2015, flu is not currently circulating at levels that would initiate CMO’s announcement to primary care). PHE has published guidance for healthcare professionals on the use of antivirals to treat and reduce the spread of flu. Whilst we know that antivirals are not a ‘magic bullet’ to prevent or treat flu in otherwise healthy individuals, there is evidence that antivirals reduce the risk of death in patients hospitalised with flu. A study of patients hospitalised with flu showed that among adults, treatment with antivirals was associated with a 25% reduction in the likelihood of death compared with no antiviral treatment. Early treatment within 48 hours of onset of symptoms halved the risk of death compared with no antiviral treatment. This supports the view that the benefit of antiviral treatment is greatest when started within two days of onset of illness. We therefore continue to support the early use of antivirals for patients with proven or suspected seasonal influenza who are in high risk groups or who are considerably unwell (even if not in a high risk group). It is essential that doctors treating severely unwell patients are not deterred from prescribing what may be lifesaving drugs as a result of confusion over whether they work; this is especially true for patients hospitalised with proven or suspected influenza. This position is consistent with that taken by the World Health Organization (WHO) and other national public health organisations such as the USA’s Centers for Disease Control and Prevention (CDC).